The Main Event makes his way from ‘Thor: Ragnarok’ to the game! We talked to D3 Go! Senior Producer Josh Austin about the new Hulk and all the beautiful destruction he promises to bring to the game. Marvel.com: We’re getting our very own Bruce Banner Hulk 4-Star! I’m geeked! He was awesome in “Thor: Ragnarok,” and I’m assuming the team is translating that awesome to “MPQ”? Josh Austin: That is correct! Hulk (The Main Event) 4-Star is inspired by the Hulk in the “Thor: Ragnarok” film. Along with his Sakaar Arena look from the movie, his power set focuses on dealing lots of damage and shaking up the board. Marvel.com: We now have a grand total of five different Hulk variations in the game. How does Hulk (The Main Event) keep things fresh? Josh Austin: Our Hulk definitely stands out! He has the Sakaar Arena helmet and all his gladiatorial garb on. Plus, this version of The Hulk is a major show-off. He starts the fight with a Grand Entrance, kicking off the fight in style, and with The Crowd Goes Wild, he roars at the crowd and the crowd roars back! Marvel.com: All right, you’ve teased the moves a bit here so let’s talk about the strongest Avenger’s abilities. What can this Hulk do? Josh Austin: Hulk (The Main Event)’s first ability is called Grand Entrance and it’s a Green Passive. 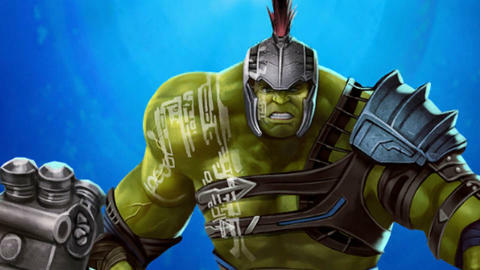 For this power, Hulk smashes his way into the Arena and wreaks havoc. At level five he destroys seven random tiles that do not deal or gain AP. Of course any cascades do damage and gain AP. At the start of the turn, he swaps two random pairs of tiles. The next power is called Gamma Bomb and it costs 14 Purple AP. Hulk channels his inner wrestling superstar, grabs his opponent, and slams them to the ground dealing damage and creating Critical tiles. The last power Hulk (The Main Event) has is called The Crowd Goes Wild and it costs 12 Yellow AP. For this ability, Hulk roars at the crowd, and they roar back cheering on the champ. This translates to creating Fortified Countdown tiles that each turn [do] one of the following: deal damage to the enemy team, give Hulk a burst of health or gain AP. Marvel.com: Grand Entrance is interesting. If he swaps random tiles at the beginning of the turn, can he create Match 5s and will that lead to extra turns for the player? Or is it more like Rocket and Groot’s I Am Groot ability? Josh Austin: There is a possibility this could happen, especially if the player gets any type of cascade from the swap or the destruction of the tiles due to Grand Entrance. Marvel.com: How were you building the big guy cover-wise? I was thinking 3/5/5 would be a pretty solid load out. Josh Austin: 3/5/5 is what I would focus on to maximize on the damage from Hulk. The Grand Entrance is a fun ability to have, but the damage from the others is better than the chance at cascades and possible damage, depending on the outcome of the tiles being destroyed or swapped. Marvel.com: And because this is a team game, whom do we want to force into the arena with him? Josh Austin: Makes sense to have anyone that can give him some Purple. Scarlet Witch is a good addition to his team for the purple generation, also Star-Lord (Legendary Outlaw). He’s strong with characters that react to Countdown Tiles like Carol Danvers, Agent Coulson, and Star-Lord (Legendary Outlaw). Marvel.com: When can we pick him up for ourselves? Josh Austin: He will be live starting tomorrow, November 16. Both the S.H.I.E.L.D training event and the Hearts of Darkness—Hulk is a placement reward in this event—starts tomorrow. The Hulk and Friends store will run November 19 through November 24. Hulk (The Main Event)’s featured event will be Webbed Wonder. His Versus Tournament is Raging Fire and it will start on November 19. There will be a third Sakaar Arena that features Hulk and this runs November 17-23. Hulk (The Main Event) will be included in the store along with a 5-Star Thor (Gladiator). Pick up Hulk (The Main Event) here and stay tuned to Marvel.com for more “Marvel Puzzle Quest” news and interviews, and follow us on Twitter @MarvelGames!